How many of us have a scarf we no longer love, or a hat that just never fit right or a pair of gloves we got at the office Christmas party and never wear? Maybe you only have one random winter item and wonder where to donate it? Why not tie it to a tree? No, seriously! Leave it for someone else in need to find it! My kids and I like to spend time at local parks where we meet new friends to play with. Right now we have a warm snap happening in the North East so families are still utilizing the parks. 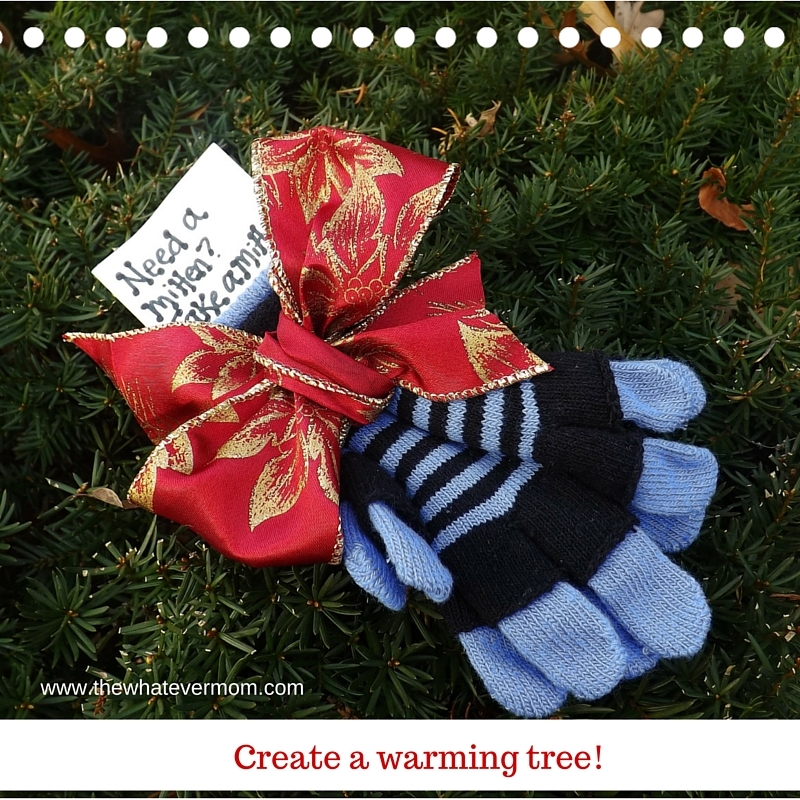 I’ve asked some of my mom friends to gather at a park to help decorate a warmth tree for families in need. Each family will bring just one hat, a scarf, and a pair of gloves or mittens. I checked with my local police and parks department and have the go ahead from both. Now, it’s up to us moms to bring one item to hang on the tree and then enjoy a play date with our kids. This is the first year we are implementing this service, but I hope we can continue to do it each year! How can you help? Kids outgrow things so quickly. Why not wash any gently used items and hang on a tree at a park, a school yard, or if you have a place in your own front yard that people pass by. 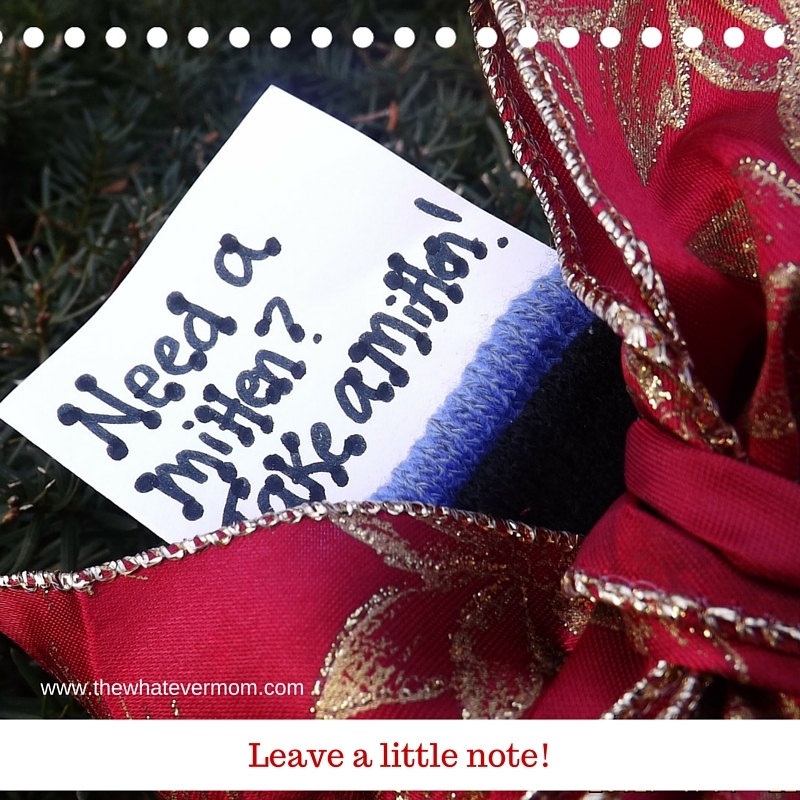 Leave a note that says “Need a mitten? Take a mitten!” to let people know it’s there for the taking. This is a really easy way to get little ones of any age involved. Even toddlers can help carry items and place them on a tree, or small bush. It doesn’t require much strength, or more than a minute of time. Sharing this random act of kindness is a fun way for kids to feel like a secret Santa and teach them that it is in the giving that we receive. That is a great idea! We participate in a coat drive every year, but those little things like mittens & scarves tend to get forgotten about. I recently saw a story of someone in my area doing something similar! We try to bring all of outgrown winter gear to the church shelter. My kids are always very concerned about the kids in our area and how they are doing. Wonderful way to help! This is such a cute idea and easy to implement and children will feel like they are helping. Fantastic! This is such a great idea. Not only does it help others in need, but also teaches children to be thankful for what they have. I love this!! 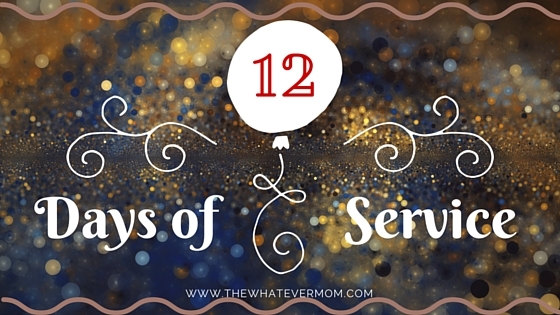 My family and I are doing 12 Days of Kindness, I’m sharing a post about it this weekend. 🙂 Great minds! This is such a sweet idea. My family and I are doing 12 days of kindness, I’m sharing a post about it this weekend. 🙂 Great Minds!! Such a great idea for the season of giving. Too often we get caught up in money, gifts and the over indulgence. I’m sorting out my closet this weekend! This is such a fantastic idea! I think so many people could use this in times of cold. I want to do this with my kids! I like the series that you are carrying out and it is lovely to carry out random acts of kindness. I love surprising someone and making their day special. Love the idea of recycling gently used stuff. I’m already a huge fan of recycling old wood as I love to use for decor and backdrops. I’ll be going through some of my stuff this weekend to give away what we don’t need anymore! Love giving back to others. Each year we go through our closet and give a lot away to friends, family and those who don’t have much. I love this idea! These things might come in handy for passers by. What a wonderful idea. I love all of your day of service ideas you have been doing this holiday season. You are doing a great thing for your family and others in need. Thank you for reading along! We’ve enjoyed doing all of them together! !